» Downtown speed: Who cares? 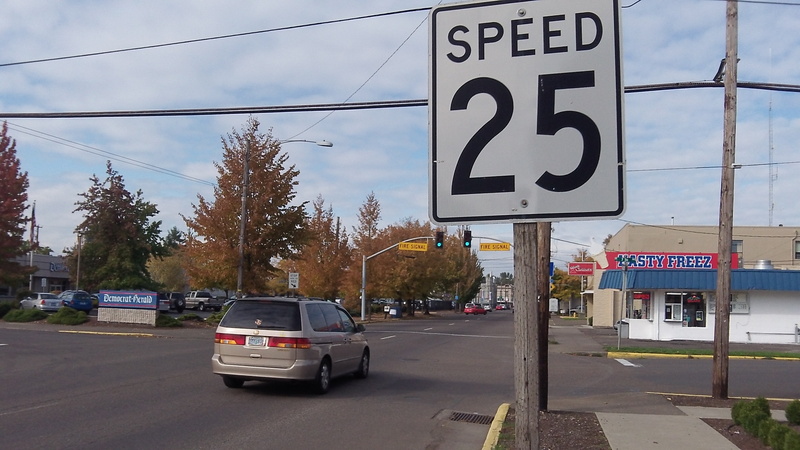 ODOT says the speed limit on Lyon Street should be 20, not 25 miles per hour. Of all the things to worry about, the speed limit on Highway 20 through downtown Albany is at the very bottom of the list. Especially if the choice is between very slow at 25 mph or even slower at 20. 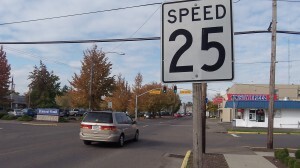 But as ODOT explains it, when they talked with the city about “decommissioning” a crosswalk at the former St. Mary’s School, because the school has closed, they discovered a discrepancy in the posted speed of the Highway 20 couplet: 25 mph on Lyon Street, the northbound leg, and no posting on Ellsworth, going south. To drivers it makes no difference. When traffic on Ellsworth and Lyon is heavy, it is always slow, and who cares what the speedometer says at such low speeds? When there is little or no traffic, at night for example, the speed limit is not important either. Rhea Graham: ODOT should concern itself with the bushes planted in the median at the head of Lyon, near the underpass (in front of The Depot restaurant). Heading west you can’t see what might be coming if you are in a compact car and aren’t very tall. The shrubs are too tall, a ground cover would be more appropriate.